Serious Stats | A weblog to accompany the book "Serious stats: A guide to advanced statistics for the behavioral sciences"
A weblog to accompany the book "Serious stats: A guide to advanced statistics for the behavioral sciences"
In the book I use the car package to get VIF and other multicollinearity diagnostics. I’ve occasionally found this breaks down (usually through mixing different versions of R on different machines at work home or on the move). I recently saw the mctest package and thought it would be useful to use that as a backup – and also because it offers a slightly different set of diagnostics. If you’d like to try it out I’ve written a helper function that makes it easier apply directly to a linear model. You can find the function and a simple example here. In an earlier blog post I provided R code for a CI of a difference in R square for dependent and non-dependent correlations. This was based on a paper by Zou (2007). That paper also provides a method for calculating the CI of a difference in independent R square coefficients based on the limits of the CI for a single R square coefficient. I’ve also been experimenting with knitr and unfortunately haven’t yet worked out how to merge the R markdown output with my blog template, so I’m linking to RPubs for convenience. You can find the function and a few more details here. I just posted brief multicollinearity tutorial on my other blog (loosely based on the material from the Serious Stats book). It is now increasingly common for experimental psychologists (among others) to use multilevel models (also known as linear mixed models) to analyze data that used to be shoe-horned into a repeated measures ANOVA design. 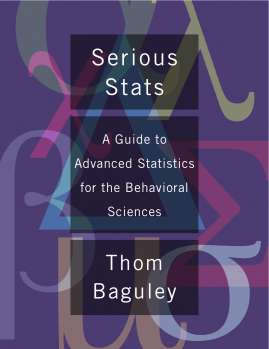 Chapter 18 of Serious Stats introduces multilevel models by considering them as an extension of repeated measures ANOVA models that can cope with missing outcomes, time-varying covariates and can relax the sphericity assumption of conventional repeated measures ANOVA. They can also deal with other – less well known – problems such as having stimuli that are random factor (e.g., see this post on my Psychological Statistics blog). Last, but not least, multilevel generalised linear models allow you to have discrete and bounded outcomes (e.g., dichotomous, ordinal or count data) rather than be constrained by as assuming a continuous response with normal errors. There are two main practical problems to bear in mind when switching to the multilevel approach. First, the additional complexity of the approach can be daunting at first – though it is possible to built up gently to more complex models. Recent improvements in availability of software and support (textbooks, papers and online resources) also help. The second is that as soon as a model departs markedly from a conventional repeated measures ANOVA, correct inferences (notably significance tests and interval estimates such as confidence intervals) can be difficult to obtain. If the usual ANOVA assumptions hold in a nested, balanced design then there is a known equivalence between the multilevel model inferences using t or F tests and the familiar ANOVA tests (and this case the expected output of the tests is the same). The main culprits are boundary effects (which effect inferences about variances and hence most tests of random effects) and working out the correct degrees of freedom (df) to use for your test statistic. Both these problems are discussed in Chapter 18 of the book. If you have very large samples an asymptotic approach (using Wald z or chi-square statistics) is probably just fine. However, the further you depart from conventional repeated measures ANOVA assumptions the harder it is to know how large a sample news to be before the asymptotics kick in. In other words, the more attractive the multilevel approach the less you can rely on the Wald tests (or indeed the Wald-style t or F tests). The solution I advocate in Serious Stats is either to use parametric bootstrapping or Markov chain Monte Carlo (MCMC) approaches. Another approach is to use some form of correction to the df or test statistic such as the Welch-Satterthwaite correction. For multilevel models with factorial type designs the recommended correction is generally the Kenward-Roger approximation. This is implemented in SAS, but (until recently) not available in R. Judd, Westfall and Kenny (2012) describe how to use the Kenward-Roger approximation to get more accurate significance tests from a multilevel model using R. Their examples use the newly developed pbkrtest package (Halekoh & Højsgaard, 2012) – which also has functions for parametric bootstrapping. My purpose here is to contrast the the MCMC and Kenward-Roger correction (ignoring the parametric bootstrap for the moment). To do that I’ll go through a worked example – looking to obtain a significance test and a 95% confidence interval (CI) for a single effect. The example I’ll use is for the pitch data from from Chapter 18 of the book. This experiment (from a collaboration with Tim Wells and Andrew Dunn) involves looking at the at pitch of male voices making attractiveness ratings with respect to female faces. The effect of interest (for this example) is whether average pitch goes up or done for higher ratings (and if so, by how much). A conventional ANOVA is problematic because this is a design with two fully crossed random factors – each participant (n = 30) sees each face (n = 32) and any conclusions ought to generalise both to other participants and (crucially) to other faces. Furthermore, there is a time-varying covariate – the baseline pitch of the numerical rating when no face is presented. The significance tests or CIs reported by most multilevel modelling packages with also be suspect. Running the analysis in the R package lme4 gives parameter estimates and t statistics for the fixed effects but no p values or CIs. The following R code loads the pitch data, checks the first few cases, loads lme4 and runs the model of interest. (You should install lme4 using the command install.packages(‘lme4’) if you haven’t done so already). Note the lack of df and p values. This is deliberate policy by the lme4 authors; they are not keen on giving users output that has a good chance of being very wrong. This approximation involves adjusting both the F statistic and its df so that the p value comes out approximately correct (see references below for further information). It won’t hurt too much to think of it as turbocharged Welch-Satterthwaite correction. To get the corrected p value from this approach first install the pbkrtest package and then load it. The approximation is computed using the KRmodcomp() function. This takes the model of interest (with the focal effect) and a reduced model (one without the focal effect). The code below installs and loads everything, runs the reduced model and then uses KRmodcomp() to get the corrected p value. Note that it may take a while to run (it took about 30 seconds on my laptop). The corrected p value is .0001024. The result could reported as a Kenward-Roger corrected test with F(1, 118.5) = 16.17, p = .0001024. In this case the Wald z test would have given a p value of around .0000435. Here the effect is sufficiently large that the difference in approaches doesn’t matter – but that won’t always be true. The MCMC approach (discussed in Chapter 18) can be run in several ways – with the lme4 functions or those in MCMCglmm being fairly easy to implement. Here I’ll stick with lme4 (but for more complex models MCMCglmm is likely to be better). First you need to obtain a large number of Monte Carlo simulations from the model of interest. I’ll use 25,000 here (but I often start with 1,000 and work up to a bigger sample). Again this may take a while (about 30 or 40 seconds on my laptop). For MCMC approaches it is useful to check the estimates from the simulations. Here I’ll take a quick look at the trace plot (though a density plot is also sensible – see chapter 18). The trace for the fixed effect of attractiveness looks pretty healthy – the thich black central portion indicating that it doesn’t jump around too much. Now we can look at the 95% confidence interval (strictly a Bayesian highest posterior density or HPD interval – but for present purposes it approximates to a 95% CI). This gives the interval estimate [0.2227276, 0.6578456]. This excludes zero so it is statistically significant (and MCMCglmm would have given an us MCMC-derived estimate of the p value). Although the Kenward-Roger approach is well-regarded, for the moment I would reccomend the MCMC approach. The pbkrtest package is still under development and I could not always get the approximation or the parametric bootstrap to work (but the parametric bootstrap can also be obtained in other ways – see Chapter 18). The MCMC approach is also preferable in that it should generalize safely to models where the performance of the Kenward-Roger approximation is unknown (or poor) such as for discrete or ordinal outcomes. It also provides interval estimates rather than just p values. The main downside is that you need to familiarize yourself with some basic MCMC diagnostics (e.g., trace and density plots at the very least) and be willing to re-run the simulations to check that the interval estimates are stable. Judd, C. M., Westfall, J., & Kenny, D. A. (2012). Treating stimuli as a random factor in social psychology: A new and comprehensive solution to a pervasive but largely ignored problem. Journal of Personality and Social Psychology, 103, 54-69. Halekoh, U., & Højsgaard, S. (2012) A Kenward-Roger approximation and parametric bootstrap methods for tests in linear mixed models – the R package pbkrtest. Submitted to Journal of Statistical Software. Ben Bolker pointed out that future versions of lme4 may well drop the MCMC functions (which are limited, at present, to fairly basic models). In the book I mainly used MCMCglmm – which is rather good at fitting fully crossed factorial models. Here is the R code for the pitch data. Using 50,000 simulations seems to give decent estimates of the attractiveness effect. Plotting the model object gives both MCMC trace plots and kernel density plots of the MCMC estimates (hit return in the console to see all the plots). Last but not least, any one interested in the topic should keep an eye on the draft r-sig-mixed-modelling FAQ for a summary of the challenges and latest available solutions for multilevel inference in R (and other packages). One of the main attractions of R (for me) is the ability to produce high quality graphics that look just the way you want them to. The basic plot functions are generally excellent for exploratory work and for getting to know your data. Most packages have additional functions for appropriate exploratory work or for summarizing and communicating inferences. Generally the default plots are at least as good as other (e.g., commercial packages) but with the added advantage of being fairly easy to customize once you understand basic plotting functions and parameters. Even so, getting a plot looking just right for a presentation or publication often takes a lot of work using basic plotting functions. One reason for this is that constructing a good graphic is an inherently difficult enterprise, one that balances aesthetic factors and statistical factors and that requires a good understanding of who will look at the graphic, what they know, what they want to know and how they will interpret it. It can takes hours – maybe days – to get a graphic right. In Serious Stats I focused on exploratory plots and how to use basic plotting functions to customize them. I think this was important to include, but one of my regrets was not having enough space to cover a different approach to plotting in R. This is Hadley Wickham’s ggplot2 package (inspired by Leland Wilkinson’s grammar of graphics approach). In this blog post I’ll quickly demonstrate a few ways that ggplot2 can be used to quickly produce amazing graphics for presentations or publication. I’ll finish by mentioning some pros and cons of the approach. The main attraction of ggplot2 for newcomers to R is the qplot() quick plot function. Like the R plot() function it will recognize certain types and combinations of R objects and produce an appropriate plot (in most cases). Unlike the basic R plots the output tends to be both functional and pretty. Thus you may be able to generate the graph you need for your talk or paper almost instantly. Below is the R code for comparison. (The data here are from hov.csv file used in Chapter 10 Example 10.2 of Serious Stats). The ggplot2 version is (in my view) rather prettier, but a big advantage is being able to add a range of different model fits very easily. The common choice of model fit is that of a straight line (usually the least squares regression line). Doing this in ggplot2 is easier than with basic plot functions (and you also get 95% confidence bands by default). The geom specifies the type of plot (one with points and a smoothed line in this case) while the method specifies the model for obtaining the smoothed line. A formula can also be added (but the formula defaults to y as a simple linear function of x). Mind you, the linear model fit has some disadvantages. Even if you are working with a related statistical model (e.g., a Pearson’s r or least squares simple or multiple regression) you might want to have a more data driven plot. A good choice here is to use a local regression approach such as loess. This lets the data speak for themselves – effectively fitting a complex curve driven by the local properties of the data. If this is reasonably linear then your audience should be able to see the quality of the straight-line fit themselves. The local regression also gives approximate 95% confidence bands. These may support informal inference without having to make strong assumptions about the model. I like the loess approach here because its fairly obvious that the linear fit does quite well. showing the straight line fit has the appearance of imposing the pattern on the data, whereas a local regression approach illustrates the pattern while allowing departures from the straight line fit to show through. One slight problem here is that the approximate confidence bands assume normality and thus are probably too narrow. If you want to know more the best place to start is with Hadley Wickham’s book. Chapter 2 covers qplot() and is available free online. The immediate pros of the ggplot2 approach are fairly obvious – quick, good-looking graphs. There is, however, much more to the package and there is almost no limit to what you can produce. The output of the ggplot2 functions is itself an R object that can be stored and edited to create new graphs. You can use qplot() to create many other graphs – notably kernel density plots, bar charts, box plots and histograms. You can get these by changing the geom (or by default with certain object types an input). The cons are less obvious. First, it takes some time investment to get to grips with the grammar of graphics approach (though this is very minimal if you stick with the quick plot function). Second, you may not like the default look of the ggplot2 output (though you can tweak it fairly easily). For instance, I prefer the default kernel density and histogram plots from the R base package to the default ggplot2 ones. I like to take a bare bones plot and build it up … trying to keep visual clutter to a minimum. I also tend to want black and white images for publication (whereas I would use grey and colour images more often in presentations). This is mostly to do with personal taste. In a previous post I showed how to plot difference-adjusted CIs for between-subjects (independent measures) ANOVA designs (see here). The rationale behind this kind of graphical display is introduced in Chapter 3 of Serious stats (and summarized in my earlier blog post). In a between-subjects – or in indeed in a within-subjects (repeated measures) – design you or your audience will not always be interested only in the differences between the means. Rarely, the main focus may even be on the individual estimates themselves. A CI for each of the individual means might be informative for several reasons. First, it may be important to know that the interval excludes an important parameter value (e.g., zero). The example in Chapter 3 of Serious Stats involved a task in which participants had to decide which of two diagrams matched a description they had just read. Chance performance is 50% matching accuracy, so a graphical display that showed that the 95% CI for each mean excludes 50% suggests that participants in each group were performing above chance. Second the CI for an individual mean gives you an idea of the relative precision with which that quantity is measured. This may be particularly important in an applied domain. For example, you may want to be fairly sure that performance on a task is high in some conditions as well as being sure that there are differences between conditions. Third, the CIs for the individual means are revealing about changes in the precision between conditions. If the sample sizes are equal (or nearly equal) they are also revealing about patterns in the variances. This is because the precision of the individual means is a function of the standard error and n. This may be obscured when difference-adjusted CIs are plotted – though mainly for within-subjects (repeated measures) designs which have to allow for the correlation between the samples. 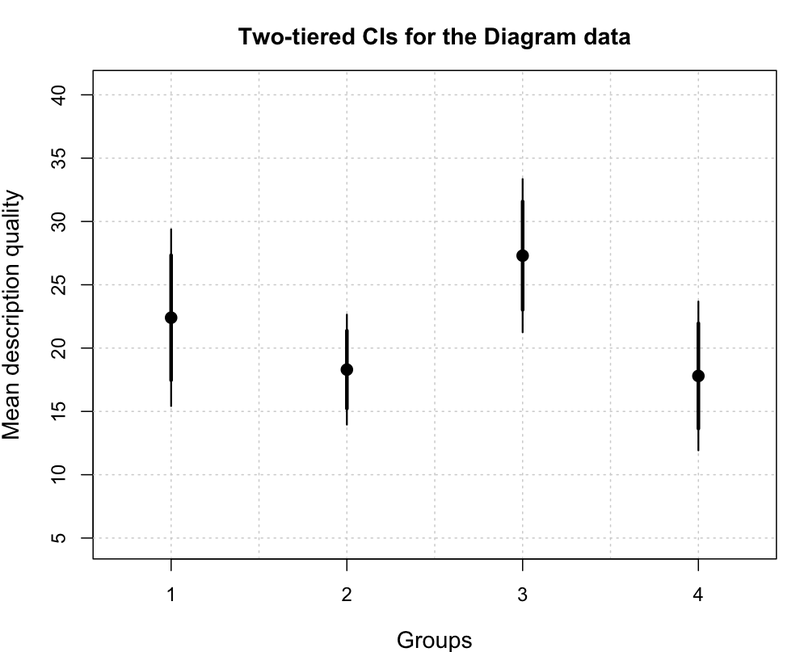 In any case, it may be desirable to display CIs for individual means and difference-adjusted means on the same plot. This could be accomplished in several ways but I have proposed using a two-tiered CI plot (see here for a brief summary of my BRM paper on this or see Chapter 16 of Serious stats). A common approach (for either individual means or difference-adjusted CIs) is to adopt a pooled error term. This results in a more accurate CI if the homogeneity of variance assumption is met. For the purposes of a graphical display I would generally avoid pooled error terms (even if you use a pooled error term in your ANOVA). A graphical display of means is useful as an exploratory aid and supports informal inference. You want to be able to see any patterns in the precision (or variances) of the means. Sometimes these patterns are clear enough to be convincing without further (formal) inference or modeling. If they aren’t completely convincing it usually better to show the noisy graphic and supplement it with formal inference if necessary. Experienced researchers understand that real data are noisy and may (indeed should!) get suspicious if data are too clean. (I’m perhaps being optimistic here – but we really ought to have more tolerance for noisy data, as this should reduce the pressure on honest researchers to ‘optimize’ their analyses – e.g., see here). ylab <- "Confidence interval for mean"
For these data the group sizes are equal and thus the width of the outer tier reflect differences in variances between the groups. The variances are not very unequal, but neither are they particularly homogenous. The inner tier suggests group three is different from groups 2 and 4 (but not from group 1). This is a pretty decent summary of what’s going on and could be supplemented by formal inference (see Chapter 13 for a comparison of several formal approaches also using this data set). A major difference between the plot shown here and that in my BRM paper or in the book is that I have changed the method of plotting the tiers. The change is mainly aesthetic, but also reflects the desire not to emphasize the extremes of the error bar. The most plausible values of the parameter (e.g., mean) are towards the center of the interval – not at the extremes. I have discussed the reasons for my change of heart in a bit more detail elsewhere. To this end I have also updated all my plotting functions. They still use the crossbar style from the book by default but this is controlled by a tier width argument. If tier.width=0 the crossbar style is used otherwise it used the tier.width to control the additional thickness of the difference-adjusted lines. In general, tier.width=1 seems to work well (but the crossbar style may be necessary for some unusual within-subject CIs where the difference-adjusted CI is wider than the CI for the individual means). When starting out with R, getting data in and out can be a bit of a pain. It should take long to work out a convenient method – depending on what OS you use and what other packages you work with. In my case I prefer to work with Excel spreadsheets (which are versatile and – for the most part – convenient for sharing with collaborators or students). For this reason I mostly work with comma separated variable files created in Excel an imported using read.csv(). I even quite like the fact that this method requires me to save the .xls worksheet as a .csv file (as it makes it harder to over-write the original file when I edit it for R). In know that there are many other methods that I could use, but this works fine for me. I do however occasionally miss some of the functionality of software such as MLwiN that allows me to paste Excel data directly into it. I’ve seen instructions about how to do this on a Windows machine (e.g., see John Cook’s notes), but a while back I stumbled on a simple solution for the Mac. I’ve forgotten where I saw it (but will add a link as soon as I find it or if someone reminds me). The solution uses read.table() but is a bit fiddly and therefore best set up as a function. I’ve included this in my master function list so it can be loaded with other functions from the book and blog. UPDATE: Ken Knoblauch pointed out an older discussion of this issue in https://stat.ethz.ch/pipermail/r-help/2005-February/066257.html and also noted the read.clipboard() function in William Revelle’s excellent psych package (which works on both PC and Mac systems). Serious stats #!1 on amazon.co.uk? As of writing the rank has dropped to #3 (but I’m still quite excited – even though I know this may not imply large numbers of pre-orders). They have also increased the discount on pre-orders to 36%. The book should also be available for pre-order in other countries (though I’ve only checked the US store), but for some reason the discount is not as generous there. If you can’t get hold of the item in your country, bookdepository.com does free worldwide delivery (to most countries as far as I can tell). I’ve used them to ship gifts to friends and family overseas and they seem pretty reliable (and also offer pretty good discounts).